So, it’s April, and it still doesn’t really feel like spring outside. But, I’ve got the urge to do spring cleaning. And what better way to do spring cleaning than to clean up my diet. Now, this isn’t some crazy cleanse. I’m done with those. This is just a mild adjustment to the slacker snacking I’ve been doing this winter. One too many bowls of chips has passed my lips. So, for April, I’m doing a month of unprocessed food. I can eat as much as I want of good, wholesome food, including baked goods (as long as they’re not full of white sugar and refined starches and such). 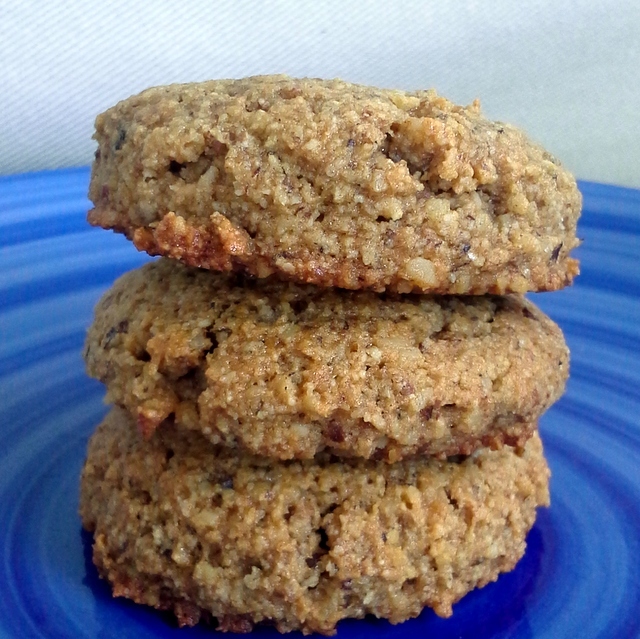 Banana, Walnuts and Maple make these cookies sing. Preheat oven to 350º. Line 2 baking sheets with parchment. In a medium bowl, beat the banana until smooth. Add the rest of the ingredients and beat until you have a soft dough. Drop dough by scoops onto the parchment paper. Wet your hand, and gently press each cookie down to about 1/2 inch thick. Bake for about 17 minutes, or until edges are browning. Cookies will be soft. This entry was posted in cinnamon, cookies, grain-free, nuts, vegan and tagged cookies, grain-free, recipes, vegan. Bookmark the permalink. What if you don’t have walnut meal? I’m fairly sure any nut meal would work – more almond flour, pecan meal, hazelnut meal. If you’ve got nuts and a food processor, you can make your own – just pulse nuts until they’re well-ground. Just don’t turn it into nut butter. Hmmm these sound great 🙂 Also I´ve got a question: are you on Pinterest?